Whale’s Frankenstein wasn’t the first film to be based on Shelley’s cautionary gothic fable – J. Serle Dawley’s short film of the same name, one of three from the silent era, predated it by 20 years – but it and its sequel The Bride of Frankenstein (1935) invented a powerful visual archetype to complement the robust moral vision of the original story, which branded itself into the collective imagination and helped to define the cinematic art-form for the post-silent era. 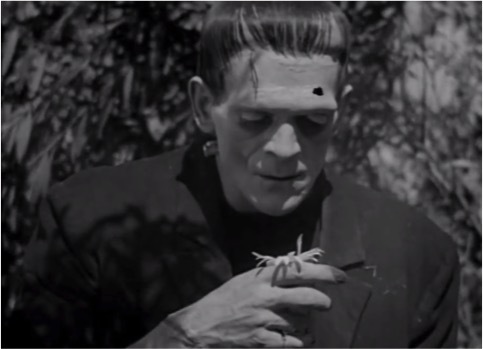 While it is obviously true that Shelley’s novel gave birth to the film Frankenstein, perhaps the most striking attribute of the latter is its originality. 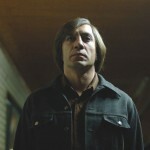 This seems paradoxical, but is actually reflective of the great revolution brought about by the development of film, the profound formal difference between it and older forms of expression and the unique transformative power of cinema to forge new imaginative worlds from familiar source material. In Frankenstein, Shelley’s tale is treated as a leaping-off point for a visually spectacular investigation into the power of cinematic language. 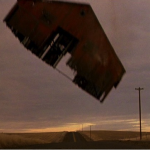 Most of the famous and memorable elements – including the monster’s appearance – have no counterpart in the original tale but demonstrate a genius for wringing meaning from the visual possibilities of the medium. While the film veers away from Shelley’s narrative, its inventions are sympathetic to her purpose and infused with a delicacy of vision which serves to accentuate the horrific and philosophical elements of the original story. 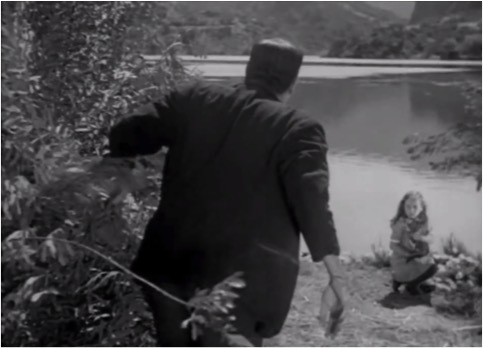 In the sequence shown below, the fleeing monster, played with infinite pathos by Boris Karloff, happens upon a young girl casting petals into a lake. The creature is, at first, uncomprehending, but gradually approaches and joins in with the child’s games. 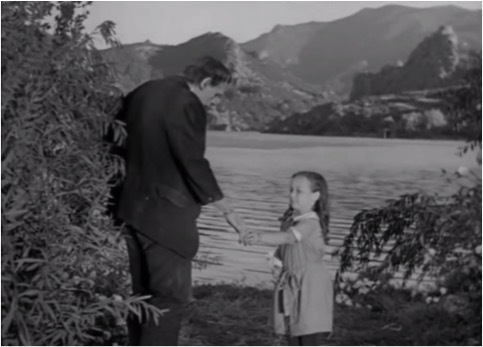 Great meaning can be discerned in the creature’s mimicry of the girl and readiness to be playful, the child’s unprejudiced response to the ostensibly monstrous apparition and the contrast of their pure relationship with the cynical worldliness and madness depicted elsewhere in the film. The edenic scene is shattered, however, when, in a moment of profound and tragic innocence, the creature, equating the prettiness of the girl with that of her petals, picks her up and casts her into the lake. This is film-making of the highest order; the thematic and moral complexities of Shelley’s novel are condensed, without loss of meaning, to a potent and stirring visual metaphor: a masterful demonstration of cinema’s unique power to give concise yet powerful expression to the myriad complexities of human experience.